Laura Yuen with the St. Paul Pioneer Press poses at Eagan Hills Church with family and friends of Mike Hanson in Fallujah, Iraq. Dec. 1, 2004. This article appeared on Page A1 in the St. Paul Pioneer Press on Dec. 4, 2004. It documented one of the first video conference sessions at Eagan Hills Church with deployed US Marines serving in Iraq. 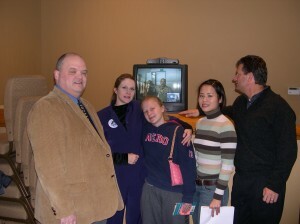 Infrasupport and Eagan Hills Church were pioneers using video over the Internet to connect families in the United States with deployed loved ones serving overseas. For the actual archive, click here and search for “Home Life in Real Time” from 2004. The Pioneer Press will want you to buy the article. Here is a convenient PDF copy of the article. You will need a PDF viewer to read it. You can grab a copy of the Adobe PDF Viewer here.